VeryDOC PowerPoint to Video Converter Command Line is a very popular software application which can help you convert PowerPoint to video formats in batch. VeryDOC PowerPoint to Video Converter Command Line is capable of converting PowerPoint to multiple file formats, such as .avi, .swf, .asf, .flv, .mov, .mp4, .mpg and so on. It can also convert SWF file to such formats mentioned before. With the help of VeryDOC PowerPoint to Video Converter Command Line, you can also change the video size by setting width and height of the output videos. You can also change the slide showing time by clicking buttons to skip to the previous or latter slide during the conversion. VeryDOC PowerPoint to Video Converter Command Line enables you to share your PowerPoint with your friends on the internet like in your blog. Converting PowerPoint to Video facilitates the access to your PowerPoint on portable devices like iPod, PSP, iPhone, Pocket PC and Blackberry. VeryDOC PowerPoint to Video Converter Command Line has the capacity to convert PowerPoint to video in multiple formats, namely .avi, .swf, .asf, .flv, .mov, .mp4, and .mpg. You can convert a single PowerPoint to one video in the any of the mentioned formats. And you can also convert multiple PowerPoint files to video files in batch. VeryDOC PowerPoint to Video Converter Command Line can be used to record slide show to video via command line. You are allowed to record slide show in presetting showing order, or you can change the slide showing order by hand. The parameter –manual enables you to rearrange the showing order of slides while converting PowerPoint files to video files. For instance, you can either record slide show in the following order: slide 1-slide 2-slide 3, or you can record slide show in the order as follows: slide 1-slide 3-slide 2-slide 1. Convert PowerPoint to video via Command Line. 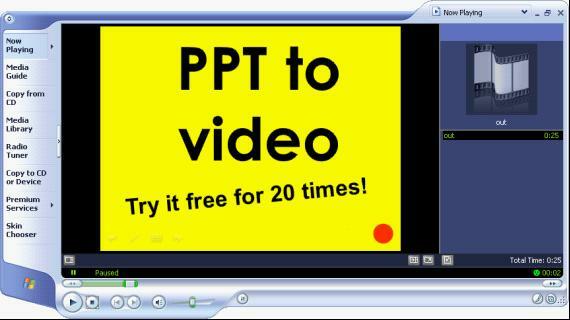 Convert PowerPoint to video in format, namely .avi, .swf, .asf, .flv, .mov, .mp4, or .mpg. Convert files in the format .swf to .avi, .swf, .asf, .flv, .mov, .mp4, or .mpg. Support batch conversion from PowerPoint to video, and SWF file to video via command line. Allow users to set width and height of output video files. Allow users to change the showing order of PowerPoint when they record slide show to video files.